My research focuses on the stress of parents whose infants are born with congenital heart disease requiring surgery in the neonatal period. The recent article published in ANS built upon my dissertation work on maternal stress in a pediatric cardiac intensive care unit, where I used research instruments to quantitatively measure stress and anxiety. The study elucidated some of the relationships between maternal stress and anxiety in the critical care environment, but I was hungry to understand more. I wanted to conduct another study to examine additional factors influencing the stress experience for mothers using the model I had created for my dissertation, the PCICU Parental Stress Model. 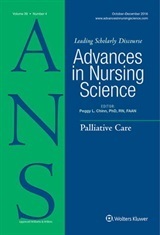 The ANS publication represents the fruition of the work that I was able to complete under the leadership of my postdoctoral mentor, Dr. Barbara Medoff-Cooper, and with my colleague, Dr. Nadya Golfenshtein. We conducted focus groups with mothers and used directed content analysis to clarify specific foci of stress and to refine the PCICU Parental Stress Model. My goal is continue to use the model as a foundation for future research. In my current postdoctoral fellowship at the University of Pennsylvania School of Nursing, I am expanding my research on parental stress to include the use of biomarkers and to begin to test interventions to reduce parental stress in this population. ← ANS 40:4 just released; new featured topics announced!